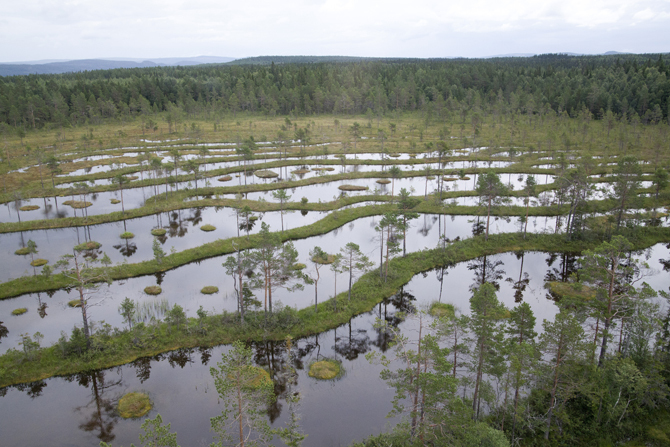 One of the objectives that the Swedish Environmental Protection Agency (SEPA), and on a regional level the County Administrations, have the responsibility for is "Thriving Wetlands", for which it is stated: "The ecological and water-conserving function of wetlands in the landscape must be maintained and valuable wetlands preserved for the future." In order to fulfil the national and regional environmental goals the SEPA and the County Administrations need cost-effective methods that can produce comparable results at recurrent occasions. Together with our partners we have developed a satellite-data based method for monitoring of Swedish wetlands suited for both regional and national levels. Since 2007 monitoring of the Swedish wetlands using satellite data is performed operationally within the national environmental monitoring program. An open mire. Photo: Jonas Salmonsson, County Administrative Board of Västernorrland. The monitoring is funded by the Swedish Environmental Protection Agency. We are geoinformatic consultants, offering services comprising information products and methodological solutions, based on remote sensing and GIS technology, with focus on natural objects with high conservation value.